The westerly storm that has battered most of the country over the last few days will abate over the weekend. Strong to gale force winds today will become fresh westerlies by Saturday then turn to light to moderate southwesters by Sunday. Good fishing reports have been recieved all along the east coast and that will be the place to be kitefishing this weekend. I have got the hubs on our nissan fixed but we are still snowed under with work. The kitefishing demos will recommence next weekend, keep an eye on your inbox for details. We are hoping to head north of Auckland and kitefish at either Tokerau or Ninety Mile Beach. If you wish to be notified of exactly where and when our next kitefishing demonstration will be held you can subscribe here now to be notified of the details. Last week we drove about 1.5 kilometres down the beach from the northern end of Pakiri Beach and spent three hours fishing with my Flexiwing Dropper Rig. Using fresh mullet for bait, our first set of 10 hooks returned nine nice snapper. Setting again, this time with only nine hooks, I caught another nine snapper, a 100% hook up rate. Our total catch for the day was 18 snapper ranging in size from 1 to 4 kg from only 19 hooks set. The week before I had two sets for 6 nice snapper. The fishing has been great lately and I regularly catch my limit bag of snapper. I use 4/0 Target hooks and reckon they are the best. I get an awesome catch rate of big fish. Just got back from an eventful day at Te Arai Point. 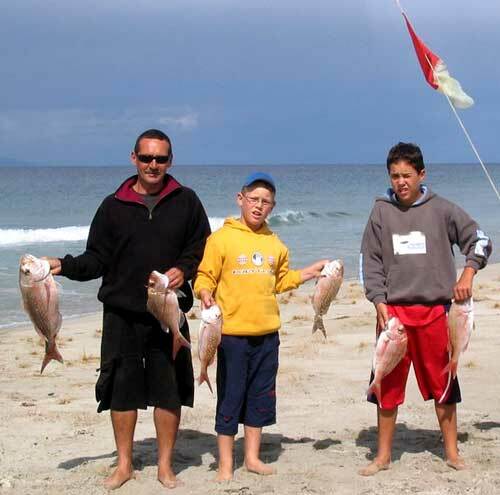 For one reason or another Te Arai, in my opinion, is one of the more challenging and rewarding east coast beaches to kite fish. In my experience, here are a few of the things you're up against. It's a hundred kilometers from anywhere really. People know about it! Sometimes fishing room is hard to find (even harder if you don't have a 4WD vehicle). For some reason, the wind at Te Arai can be blowing in a different direction than it is anywhere else on the east coast. The wind can, and often does, stop without notice. Then returns from totally the opposite direction. That's just kitefishing I guess and won't be news to anybody, but of all the beaches I fish Te Arai has snuffed out my aspirations of a good days fishing more than any other beach. It wouldn't be so bad if it wasn't so far from anywhere else really. Today we arrived at the beach around midday. High tide was at 3.20pm so we were eager to get the baits in the water and fish through the top of the tide. As we headed for the access to the beach I put on a brave face and pretended not to be concerned at the size of the hail stones bouncing off the bonnet of the truck. On the way down the beach we passed several other grim faced fishos who were also seemingly oblivious to the conditions. Ten minutes later we selected our spot and with clearing skies proceeded to set up the bottom longline rig for action. By the time my son got the kite attached to the line there wasn't a breath of wind anywhere. Unfazed, I proceeded to deal to the fresh mullet and trevally we had picked up on the way for bait, assuring the boys that everything was sweet. To my relief, ten minutes later the breeze returned at about 15 knots southwest. The line was sent out with 20 hooks, all baited with fresh mullet, and was a near perfect set of around 900 meters straight out. We left it for about 45 to 50 minutes and hauled it in. Five nice snapper in the bag and lots of bait still to use suggested this would be an awesome day. Some time ago I switched to Target Snapper Hooks and can't praise these hooks enough. Since using them I have NEVER had to kill a fish to get my hook back. I'd even go so far as to say a Rock Cod couldn't swallow one of these things. On the second set I mixed the baits up 50/50 mullet and trevally and returned the line to almost exactly the same spot and left it for about an hour. On hauling it in we found another four nice snapper with one going close to 4kg. It was interesting to note that all the trevally baits were returned to the beach untouched, every fish taken was on mullet. Not wanting to tempt fate with another set and with the skies blackening we called it a day and started out on the one hundred kilometer trip to ..........dinner. Recently fishing a boat longline from my kayak off Mairangi Bay I wound up with 9 good snapper using 5/0 Target hooks baited with squid. At about 9:30pm I ran three sets of 10 hooks each during an incoming tide in about 20 feet of water. We spotted Kite club members Tony Talbot and Noel Thomas at Muriwai Beach recently, they were just pulling in their third and last set for the day. 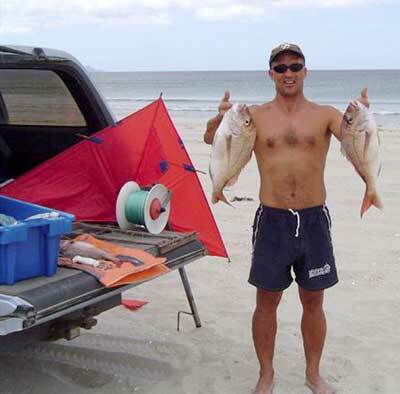 Tony uses a small 5 hook dropper rig on a beach reel spooled with 2000 metres of 37kg spectra line. Due to the light weight and low wind resistance of the spectra line he had no problems getting his gear out full distance and almost dead square offshore in the challenging light wind, strong rip conditions. Their first set had resulted in one large stingray and a kahawai while the second set returned two snapper with the biggest weighing around 4lbs. Paul and I watched as they retrieved their third set. The line was very heavy and several times they had to stop hauling and allow the line to go back out in order to not risk losing the obviously big fish on the other end. Tony hauls in his final set. The glove prevents the spectra from slicing through his flesh like cheese wire. 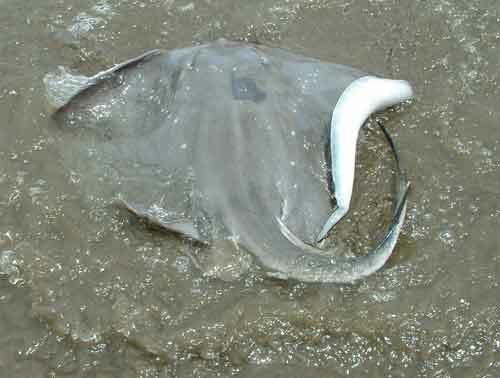 One very angry stingray which would have weighed around 20kg. Each time we attempted to it move back into the surf it lashed out and grunted at us. It was an amazing feat to haul such a large ray in by hand on spectra line. 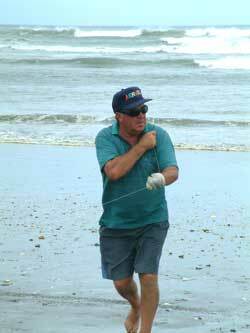 Just the week before Tony was Kitefishing up at Pakiri Beach on the east coast, north of Auckland. He wound up with catching one giant snapper which weighed in a 10.2kg plus several pan sized snapper for the day. 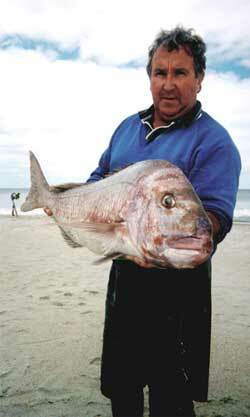 Photo Left Tony Talbot with a great 10.2kg snapper taken from Pakiri Beach. A good day today, January 23rd, a moderate southwest wind blowing and an outgoing tide. Fishing with my kite powered bottom longline rig baited up with squid I wound up with one 2.5kg snapper and 3 pannies. I always seem to get fish, but at the moment mostly only just over the minimum size limit. This should change over the next two months though! To indicate the damage paddle crabs do to bait, today's first set went just into the surf line before I realised I had the weighting all wrong and needed to retrieve the lot and start again, otherwise it wasn't gonna go anywhere. After ten minutes in the sea I got back 16 stripped hooks and most of the remaining baits were almost nibbled away! Getting through that first couple of hundred meters quickly is so very important, otherwise you are going to be fishing with bare hooks. Not recommended! I fished my new powertiki off the beach at Mokau late January due to a lack of wind for my kites. It went really well with a lot of interested onlookers. I caught an 8.2kg snapper along with a 4kg snapper on the same set. Overall, there is not a lot of fish to be caught here right now but I did manage to catch 6 snapper, 3 kahawai and a gurnard over two days fishing using the powertiki and Target hooks baited with kahawai. 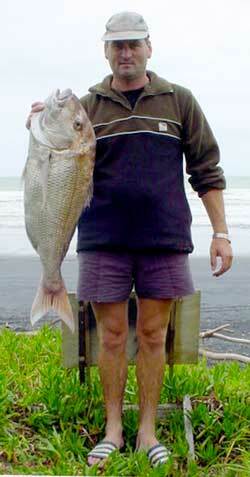 Hopefully when the easterlies come to Mokau again, the fish will be there too! Can't complain too much though with the big snapper caught making up for a lot of small ones missed. Hi, Got a nice snapper this morning, about 8lb, before work off the barges out from Narrowneck beach on the far side of the shipping channel. 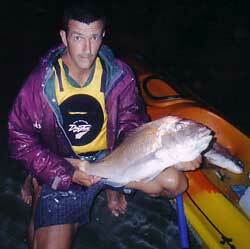 Also the guys have been getting good sized snapper off the green marker just on the north side of Narrowneck Beach. I went up to Muriwai on Sunday February 1st, about 2 to 3 kilometres north of Rimmers road. Northeasterlies of 20 knots plus, I arrived about 2:00pm and clipped on the kite and sent it up with the skyhook. I put a small tack on the kite as it wasn't quite straight offshore and had a little trouble getting my rolling weights right as the wind was quite strong. I had six lead wheels on and it was still lifting so I clipped on a couple of extra longline weights and that did the trick. I let the gear go out with 20 hooks and a mixture of squid, mullet and bonito. The skyhook did its job well, adding the extra grunt to get it all out and in no time I had about 30 metres left on my reel. About 45 minutes later I hauled it in with 11 snapper, the biggest was 5 to 6 lbs, one gurnard and a kahawai. One of the snapper and a gurnard got chomped in half by a small shark, I'm thinking I may have left it out a bit too long. I baited up and sent it out a second time, this time only ten hooks and half the distance offshore. Around 25 minutes later I pulled in and caught only one snapper, a good pannie though. It was awesome conditions with flat seas and bugger all surf.